At a meeting of the Tibet Autonomous Region (TAR) Provincial Public Security Bureau in Lhasa on 25 th February, 2017, the Director of the National Public Security Bureau presented the Work Report of the Public Security Bureau in the entire Tibetan areas for the year 2016 and outlined the deployment of Public Security Officials and their work assignments for the year 2017. The meeting was attended by He Wenhao, Vice-Chairman of the Tibet Autonomous Region (TAR) People's Government and Deputy Secretary of the Politics and Law Committee of the TAR and Member of the TAR Standing Committee. Among others who attended the meeting was Liu Jiang, Deputy Secretary of the TAR People's Government. He Wenhao, who previously was the Deputy Secretary and member of Standing Committee of Ningxia Hui Autonomous Region Party Committee, while speaking at the meeting appreciated and applauded the officials of the TAR Public Security Bureau for upholding and implementing the ‘ten measures' concerning stability and security in the region. He further urged officials of all levels of Public Security Organs to grasp the fundamental rules of security laws; strengthen and enhance intelligence bureaus; reform household registration formalities; implement preferential treatment measures; strengthen information dissemination mechanisms; make police controls stricter; and promote honest public security teams. Chinese President Xi Jinping attended a gathering with ethnic minority deputies and political advisors on the sidelines of the National People's Congress (NPC) and Chinese People's Political Consultative Conference (CPPCC) sessions at the banquet hall of the Great Hall of the People. Kelsang Dolkar , a Tibetan deputy to the NPC greeted Xi Jinping and briefed him about the status of the education system, medical services, household registration systems etc. in her village. She was followed by a Deputy from the Xinjiang Uygur Autonomous Region who briefed Xi Jinping on the progress in local development. Xi Jinping told him to make “solid” efforts for maintaining ethnic unity and social and political stability. All other members of the Standing Committee of the Chinese Communist Party (CCP) Central Committee (CC)'s Political Bureau (PB), including Li Keqiang, Zhang Dejiang, Yu Zhengsheng, Liu Yunshan, Wang Qishan and Zhang Gaoli, attended the gathering. The NPC Deputies and CPPCC advisors were advised to contribute to the Chinese nation's rejuvenation efforts. The gathering was chaired by Jampa Phuntsok (Ethnicity: Tibetan), Vice Chairman of the NPC Standing Committee. The meeting concluded with a cultural performance by people of ethnic minorities. Chinese Foreign Ministry spokesperson Lu Kang, said at the regular press briefing on March 31, 2017, that China is firmly opposed to any visit by the Dalai Lama to the disputed border region between China and India. He said "China is gravely concerned about this. Our stance on the eastern part of the China-India border is clear and consistent." He was quoted by Xinhua as saying that the "Dalai Lama has long engaged in anti-China separatist activities and has behaved disgracefully on the China-India border issue". He said "India understands the seriousness of the Dalai Lama issue and the sensitivity of the border disputes" and that "India's invitation to the Dalai Lama for activities in the disputed border areas will gravely damage peace and stability of the border areas, as well as bilateral relations". Lu Kang said "China demands the Indian side meet its political commitments on Tibet-related issues and abide by the consensus reached by the two sides on border issues" and urged India to refrain from taking actions that could further complicate the China-India border issue and to "not provide a platform for separatist activities of the Dalai Lama clique" in order to safeguard the healthy and stable development of bilateral ties. He said "Maintaining a good relationship between the two big developing countries serves the interests of the two peoples. But China-India relations are based on certain principles." He added "Therefore, we urge the Indian side to deliver its political commitments on this issue so that bilateral relations won't be hurt. Otherwise, it will also be detrimental to India." Fu Ying, former Chinese diplomat and spokesperson for the just ended (March 15) plenary session of the NPC, seemed to strike a conciliatory note when, according to the China Daily website news, she said on March 4, 2017, that “We cannot settle some problems for the moment, but we should not stop stepping forward just because of the problems.” Mentioning that there had been some disagreements between the two countries for years, she said “I believe that, for China-India relations, we should take both certain trees and the whole forest in sight.” She indicated there had been significant progress in relations between the two countries in the recent past. She pointed out that in the past, it was difficult to travel to India from China because there were few flights linking the two countries, but now around 40 flights connect China and India each week. She has added that leaders of both countries have also been meeting frequently in recent years. She added that the Chinese and Indian militaries visit each other annually, and the two sides have established a cooperative mechanism to fight cross-border crimes and counter terrorism. Chinese Premier Li Keqiang called for maintaining the stability and development of TAR when he joined a panel discussion with National People's Congress deputies from Tibet on March 7, 2017. He said that 2017 will see further endeavours in promoting Tibet's stability and development, through focusing on key ways to improve the local people's livelihood. He vowed to improve public services in areas such as education, healthcare, and development of Tibet's special and competitive industries such as tourism, clean energy and ethnic medicines. He noted that Tibet's annual GDP growth was 11.5 percent, ranking it first among China's provincial-level regions. He emphasized that China will strengthen support and funding for Tibet's transportation and power-grid infrastructures. He urged the Deputies from Tibet to strengthen unity and help all ethnic groups to get along with each other, promote religious harmony as well as safeguard social stability and long-term peace. Yu Zhengsheng, Liu Yunshan and Wang Qishan, all members of the Politburo Standing Committee, also joined the discussions. Lhoka (Ch: Shannan) Municipality's Politics and Law Committee met on 25th March, 2017 to discuss Social Security Management and review last year's work. The Secretary of the Politics and Law Committee and Secretary of the Municipal Public Security Bureau, Gong Bing, chaired the meeting and spoke on the importance of strengthening social security in Lhoka and improving the judicial and control mechanism. He urged the officials to enhance their sense of responsibility, take new initiatives and implement the guidelines enshrined in the CCP's 18th Party Congress vis-a-vis law and discipline. He also spoke on the importance of ensuring ‘clean government', efficient police officers and adherence to law by all officials of Lhoka in order to ensure an effective and stable administration. In early March, Gong Bing visited the headquarters of Tsethang (Ch:Tsedang) Special Police Detachment where he met retired and veteran military and police officials. While meeting the old cadres he asked them to continue to maintain their firm political stand against ‘splittism,' and unswervingly help safeguard the ‘motherland's national unity'. The veterans assured the Secretary that despite their retirement, they would continue to extend their help in maintaining public security in Lhoka. A Tibet Autonomous Region (TAR) delegation wrapped up its four day trip to Britain on 28th March. The delegation visited the British Parliament, Westminster University and met politicians, students and the media. Headed by Padma Choling (Ethnicity: Tibetan), Chairman of the TAR People's Congress and one of the most senior ethnic Tibetans in TAR politics and the longest serving Tibetan in the Chinese Communist Party, the delegation met the Deputy Leader of the Manchester City Council, Sue Murphy. Padma Choling said China's people's congresses at different levels are ready to strengthen communication with their counterparts in Britain and Manchester City and promote exchanges between the two countries and the two peoples. Murphy replied that she is happy to see the cultural diversity in China and expects to visit Tibet. The delegation also met experts and students at the University of Westminster where they spoke of Tibet's socio-economic development, poverty reduction efforts, ecological and cultural protection as well as religious freedoms. The delegation visited the British Parliament on 28th March and met Crispin Blunt, Chair of the Foreign Affairs Committee and Richard Graham, Chair of the All Party Parliamentary China Group. Padma Choling said the visit embodies the friendship between the two countries and he hopes a real Tibet can be demonstrated to the British. British politicians said they expect that Britain and China can strengthen their communication between the parliaments at different levels. They also said that many reports on Tibet by the Western media are unbalanced and that the visit of the delegation is expected to help the British people get to know ‘a true Tibet'. The delegation also held a seminar with editors and journalists from the British media in the city on 28th March. China's official news-agency Xinhua reported on March 29, 2017, that a delegation of Deputies to China's National People's Congress (NPC) – China's version of a parliament – representing the Tibet Autonomous Region (TAR) arrived in Zurich on the night of February 28 for a four-day visit after spending four days in Britain. The delegation was headed by Padma Choling, a senior member of China's NPC Standing Committee. Xinhua said the visit's aim was to publicise the latest information regarding TAR's social and economic development, environmental protection, as well as cultural inheritance. The Xinhua despatch said that the delegation was scheduled to meet with the Swiss media and “local inhabitants from Tibet”. It was to also visit the Swiss capital Bern to meet officials from the Swiss parliament and the Ministry of Foreign Affairs. The Deputy Secretary of the TAR Party Committee since 2013 and Secretary of the Politics and Law Committee of TAR, Deng Xiaogang visited an old age home and some households in Takser County of Lhasa Municipality. Kalsang Tsering (ethnicity: Tibetan), Vice-Chairman of the TAR People's Government, Karma (ethnicity: Tibetan) Vice-Chairman as well as standing committee member of the 10th TAR People's Congress and the President of the TAR Women's Federation, Gao Yang, Vice-Chairman of the TAR PPCC, along with some others accompanied Deng Xiaogang. Deng Xiaogang greeted and interacted with the elderly people at the old age home. He also met people from other households in the neighborhood, whose houses were funded by the TAR Party Committee with subsidies, and enquired about their well-being. The members of these households thanked him and the TAR for providing them with better houses with good facilities. Deng Xiaogang presented them with bags of Chinese tea brought from his hometown while he was gifted a book written by Chairman Mao and published in 1960. Before leaving, he asked the people to uphold the core values of socialism and work towards building national unity. Nagchu (Ch: Naqu) prefecture celebrated the 28th March as the 58th ‘Serfs Emancipation' Day. Over a thousand people from 142 households, nine towns, and representatives of schools, monasteries, army, police, youth, students farmers and herdsmen, young students, and monks and nuns began the day with the hoisting of the national flag of the People's Republic of China and singing the CCP's national anthem . Nagchu's Party Secretary, Sangay Tashi (ethnicity: Tibetan) and who replaced Gao Yang, attended the ceremony and spoke. Liu Quan, Deputy Secretary of the Nagchu Party Committee and Nagchu Administrative Commissioner presided over the celebration. In his speech, Sangay Tashi welcomed the people of ethnic groups in Nagchu and thanked the army who ‘sacrificed' and ‘liberated' Tibet and ‘abolished the feudal system existed prior to 1959.' He spoke of the historical significance of the day and highlighted the CCP's achievements in Tibet since then. He urged all officials of Nagchu Party organs, cadres, and the masses to hold high the ‘great banner of socialism' with Chinese characteristics, more importantly with Deng Xiaoping's theories of upholding the basic spirit of Communism, People's democratic dictatorship, leadership of the Communist Party, Marxism-Leninism and Maoism and also to implement the spirit of General Secretary and President Xi Jinping. Some officials of TAR Party Committees, Deputy Secretary of the TAR PPCC and the Vice Chairman of the TAR United Front Work Department, Minjiang, made a surprise inspection trip to Nagchu on 28th March, 2017 and met the head cadres of monasteries in Nagchu along with the county leaders. The Team also met the monks and nuns of Jamyang Chokhorling Monastery, Tsedan Monastery, Drongna, Tarmoe, and Rabten monasteries. After visiting these monasteries the inspection team called a meeting of all the heads of the monasteries and county heads and discussed Nagchu's ‘Religious Management' work. The monastery heads showed their work reports while the inspection team instructed them on the next steps of monastery management for the year. (Note: Tulku Tenzin Delek Rinpoche, who established nine monasteries throughout Nagchu Prefecture, as also old age homes, schools for underprivileged Tibetans and free food, was arrested from the Jamyang Cholkhorling Monastery for alleged involvement in the bomb blast in Chengdu and Beijing. The 65-year old Tenzin Delek Rinpoche, died while serving a prison sentence on charges of “terrorism and inciting separatism” in Sichuan Province in 2015. He was one of the most prominent Tibetan religious leaders). Norbu Dhondup , Member of the Standing Committee of the TAR Party Committee, President of the TAR People's Higher Court and Party Secretary of Chamdo (Ch: Qamdo/Changdu) convened a meeting on the 20th March of all regional party leaders to discuss individual work reports, evaluate and assess their work and study new directives and projects issued by the TAR under the aegis of the CCP. After the presentation of individual work reports, Norbu Dhondup gave his analysis and observations. He asked the officials to take greater responsibility in maintaining long term social stability and harmony as well as take Chamdo higher on the ladder of development and economic prosperity. Nyingtri Mainling Airport, the second-largest airport terminal in southwest Tibet, officially started operations on March 6, 2017. It is one of the six new airports operationalised in Tibet. Official reports claim the new terminal at Nyingtri Mainling Airport covers an area of 10,300 square meters and will be able to handle 750,000 passengers and 3,000 tonnes of cargo annually by 2020.The reports say that Nyingtri airport will open new direct air routes to Xi'an, Shanghai, Hangzhou and other key cities in China, resume routes to Beijing and increase more round trip flights to Lhasa, Guangzhou, Kunming, Chongqing and Shenzhen thereby building an improved air transportation network system. Liu Wei, Deputy Director of Civil Aviation Administration of China in Tibet, said the new airport terminal will alleviate pressure on Nyingchi Mainling Airport. The Lhasa to Lhoka (Ch:Shannan) Expressway Construction, which started on August 26, 2016, is progressing well according to reports of March 06, 2017. The expressway is 47.46 kilometers in length with bi-directional four roadways. The designed speed for the expressway is 80 kilometers per hour. The project was started to bring the benefits of development to Lhasa and Lhoka, and also to improve the people's livelihood and accelerate development of the region's economy. The Linzhi Aerospace Science and Industrial Investment and Development Co. Ltd. owns the Hilton Linzhi Resort, which opened on March 22, 2017. The hotel is served by the Nyingchi airport located 7 kms away. The TAR government and Chinese Academy of Sciences have agreed to launch a large-scale survey of the Qinghai-Tibet Plateau, 40 years after the first was conducted. Scientists will set out in June to investigate changes in resources, ecology and the environment on the plateau. Their findings will be used to provide scientific support for environmental protection and economic and social development in Tibet. New technologies, including drones and satellites, will be employed to cover the whole area and capture more comprehensive and accurate scientific data. A total of 4 billion yuan (US$ 581 million) is to be invested in 12 projects in the TAR's Konggang New District this year. Centered on Lhasa Gongkar International Airport, about 56 kilometers southwest of the region's capital, the new district was established in 2015 with the aim of becoming a modern logistics and service industry hub. It includes Gyadrugling Town of Gonggar County and Gonggar Airport. Konggang New District will build a “sharing space” and a “functional space” and form a functional structure of “one center, five clusters”. 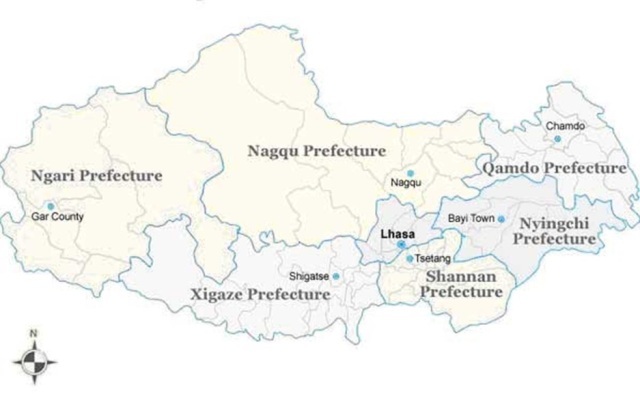 “One center” refers to Lhasa Gonggar Airport. “Five clusters” comprises the Konggang urban comprehensive functional area, Konggang modern service industrial functional area, Konggang supporting service functional area, western business functional area and Konggang administrative office. Konggang modern service industrial functional area covers Konggang new area logistics park, Konggang new area service park, Konggang new area industrial park with highland characters, Konggang new area ‘pure land' industrial park and Konggang new area industrial innovation center. Cui Jianyong, Director of the Konggang New District Administrative Committee, said the projects to be undertaken include expansion of the airport so that it can handle 9 million passengers and 80,000 metric tons of cargo by 2025; construction of roads; sand stabilization; quinoa planting and chicken breeding programs and eventually to turn the district into a sub center of Lhasa. Du Qi, an official with the committee, said projects such as quinoa planting had already proved effective for generating more money for the area. More than 60 hectares of quinoa were planted last year. Another 25 hectares of quinoa are set to be planted this year. He said the government plans to invest more than 15 billion yuan in the district during the 13th Five-Year Plan period (2016-20). Zhoushu, Director of the Tourism Bureau of Ngari, said early this month that during the 13th Five-Year Plan period Ngari will focus on construction of the Gangdise International tourism cooperation zone. The Gangdise International tourism cooperation zone will include Tulin, the scenic spot of Guge, and Pangong-Tso Lake. It will lie along the China National Highway 219. As a pilot project, the Cooperation Zone will view wild animal protection activity in the Changtang (Western Tibet) Nature Reserve. The Gangdise International tourism cooperation zone mainly covers Ngari Prefecture, Shigatse and Lhoka but plans are to extend it to the surrounding areas such as India and Nepal. Nepal and China have pledged to further develop their ties as Nepal expressed its willingness to join China's Belt and Road initiative. When meeting the visiting Chinese Defense Minister and State Councillor Chang Wanquan in Kathmandu on 23rd March, Nepali Prime Minister Pushpa Kamal Dahal (@ Prachanda) highly appreciated China's neighborhood diplomacy featuring amity, sincerity, mutual benefit and inclusiveness. He thanked China for its assistance in Nepal's socio-economic development and national defense, especially Chinese aid for post-quake reconstruction after a devastating earthquake hit the Himalayan nation in 2015. Pushpa Kamal Dahal said "Nepal is committed to the One-China policy and it will always stand against anti-Chinese activities. Nepal is keen to be a partner of the Belt and Road initiative." The Silk Road Economic Belt and the 21st Century Maritime Silk Road initiative, known as Belt and Road initiative, was proposed by China in 2013 with the aim of building a trade and infrastructure network connecting Asia with Europe and Africa along ancient trade routes. Chang Wanquan replied that China appreciated Nepal's strong support for its "core interest" issues of Taiwan and Tibet. Chang Wanquan added that leaders from both sides have reached consensus on deepening bilateral ties, which has guided the direction of development of relations between the two countries and two militaries. He said China is ready to join hands with Nepal to further promote their comprehensive partnership of cooperation so as to benefit the two peoples. The Chinese Defense Minister and his Nepali counterpart Balkrishna Khand met the same day to discuss ways to strengthen military cooperation between the two sides. Both sides agreed to implement the consensus reached between leaders of the two countries, maintain high-level military exchanges, tighten border control, and deepen pragmatic cooperation in various fields. The total volume of trade at the border port of Gyirong in the TAR touched 3.4 billion yuan (US$ 490 million) in 2016, a 4.5-fold increase year on year, according to Yin Weifeng, Deputy Director of the Lhasa Customs on 21st March. After a severe earthquake hit Nepal on April 25, 2015, closing Dram (Ch: Zham) and Gyirong ports, Tibet's foreign trade fell to about 5.7 billion yuan in 2015, down 59.2 percent. In October 2015, Gyirong port reopened and China-Nepal trade recovered. Gyirong has now taken on the trade function of Dram, which used to handle about 90 percent of the land-borne trade between China and Nepal prior to the earthquake. Yin Weifeng said "Gyirong port is expected to become a major route for trade between China and Nepal”. Quoting from the TAR's annual report to the NPC, China's official news-agency Xinhua said on March 10, 2017, that more than 60 “Living Buddhas” of Tibetan Buddhism had been “approved” in TAR during the past one year. The report also disclosed that over 1,700 “ethnic and religious activities” were held in a peaceful and orderly manner without any incident that undermined public security. It said that though TAR was geographically distant from Beijing “the hearts of people of all ethnic groups in Tibet are always together with the Communist Party of China Central Committee with Comrade Xi Jinping as the core”. The ‘Prime Minister' of the Tibetan Administration in exile at Dharamshala, India, on March 28, received a 6-member delegation from the Swiss parliament. He urged them to support his administration's Middle Way Policy which seeks genuine autonomy for Tibet under China. He informed them that the policy did not contradict Beijing's ‘One China Policy'. The delegation comprised Maya Gref from the Green Party, Rosmarie Quadranti from the Civil Democratic Party, Marianne Streiff from the EPP, Prisca Birrer Heimo from the Social Democratic Party, Barbara Gysi from the SP SG, and Gina Ruetschi from the District Council: KR. Accompanying the delegation were Thomas Buchli, President and Lhawang Norkhangsar, Vice President of the Swiss Tibet Friendship, exiled Tibetan MPs from Switzerland Ven Thupten Wangchen and Jampa Tsering Samdho, Representative Ngodup Dorjee at the Office of Tibet Geneva and Executive member Garne Deki of the Tibetan community in Switzerland and Liechtenstein. Tibet's exile spiritual leader, the Dalai Lama, on Mar 19 addressed ministers, lawmakers, and bureaucrats in the state legislature (Vidhan Sabha) building in Bhopal Madhya Pradesh. He spoke on the ‘Art of Happiness'. Vidhan Sabha speaker Sitasharan Sharma, Finance Minister Jayant Malviya and Cooperative Minister Vishwas Sarang shared the stage with the Dalai Lama. The Dalai Lama advised the state government run by the BJP to introduce universal values and ethics in education in the kindergartens, schools, colleges and institutes that groom future leaders. He criticised the caste system in India as a social evil and said all religions preach love and compassion. The Dalai Lama praised the state government's Happiness Department and lauded its Chief Minister Shiviraj Singh Chouhan for conceiving the idea. The state is the first in India to set up a Happiness Department designed to ensure happiness in the lives of the common people. Before the Vidhan Sabha event, the Dalai Lama attended the state's Narmada Seva Yatra, an environmental initiative with focus on the Narmada River led by the Chief Minister, who was personally present. The Chief Minister, in his address, offered his respect and admiration for the Tibetan leader and said that the Dalai Lama's had inspired spiritual peace and fresh energy in him. 33-year old Karmapa Thaye Dorje, leader of the Karma Kagyu sect, has reportedly given up monkhood to marry a childhood friend. His bride, 36-year-old Rinchen Yangzom, lives in New Delhi. Dorje became the 17th Karmapa of the Karma Kaygu in March 1994 when he was 11 years old. His website said that Dorje and Yangzom had been friends for more than 19 years and that their friendship grew over the years into a "into a special, spiritual bond". His website quoted Dorje as saying, "I have a strong feeling, deep within my heart, that my decision to marry will have a positive impact not only for me, but also for the lineage. Following the wishes of my parents, and having had time to reflect, I deeply feel that I am being true to both myself and the lineage. Something beautiful, something beneficial will emerge, for all of us." He also announced that he would continue to function as the Karmapa with the exception of carrying out religious ordinations. "In this 17th incarnation, for both the future of the lineage, and fulfilling the wishes of my parents, I have chosen a different path. At the same time, my commitment to protect and preserve the monastic sangha, and the lineage, remains paramount in my life, and my continued role as Karmapa," he said. The announcement said that he proposed to his wife in January in keeping with Buddhist traditions after getting permission from her father. Dorje was born in Central Tibet, but grew up in India and now lives in New Delhi. AFP reported that his father was also a high lama, and his mother is "the descendent of Tibetan nobility."